We featured our Venetian Color Thief walk-around character, an elegant interactive costume which can "steal" the colors around her and change the color of the twinkling lights in her costume and mask. Also featured were two LED Isis Wing performers with animating, color changing wings and glowing head-to-toe silver and white costumes. We rounded out the night with our top-notch light dancers -- we had two Phoenix LED hula hoops, LED double staff and contact staff, and lots of poi spinning featuring our new Genesis poi. The Genesis poi are programmable and we uploaded the Ises logo and drew it in the air every time we spun the poi. Such a fun night, in such a gorgeous setting. 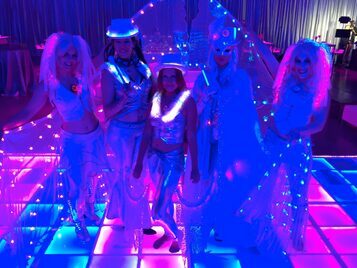 We loved dancing on the animated LED dance floor by Songa Floors to the dueling DJs from Love in the Mix. And of course thanks to Entire Productions for inviting us to perform. I love performing at events where everyone brings their best!